Scotland is a beautiful vacation destination which offers many incredible things to see and do for the whole family. From hip cities to calm country escapes, there is plenty to choose from. Visit the Highlands to enjoy the scenery, unique foods and local festivals. Listen to traditional music performed using the Highland bagpipe, including marches and dance music. The Scottish Highlands are home to beautiful mountains, waterfalls, rivers, lochs and islands. Here you will find beautiful historic castles, museums, steam trains, gardens and ancient monuments. There are over 700 islands in Scotland where you will find incredible historic attractions such as the Eilean Donan Castle, Bressay lighthouse and the Old Man of Hoy, a popular climbing spot. 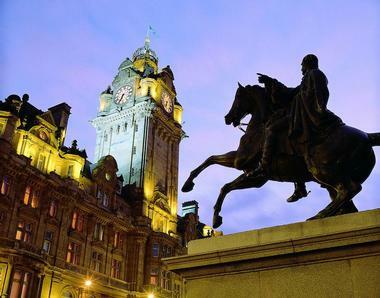 The largest city in Scotland, Glasgow offers historic sites, restaurants, museums and other attractions. Edinburgh is the capital city of Scotland, featuring a beautiful Old Town and New Town which are listed as a UNESCO World Heritage Site. Royal Mile connects Edinburgh Castle to the Palace of Holyroodhouse. Edinburgh Castle attracts 1.2 million visitors per year and dates back to the 12th century. Holyrood Palace has been the official residence of the the Kings and Queens of Scots since the 16th century. The National Museum of Scotland houses collections of Scottish archaeological finds and medieval objects, as well as artifacts from around the world. 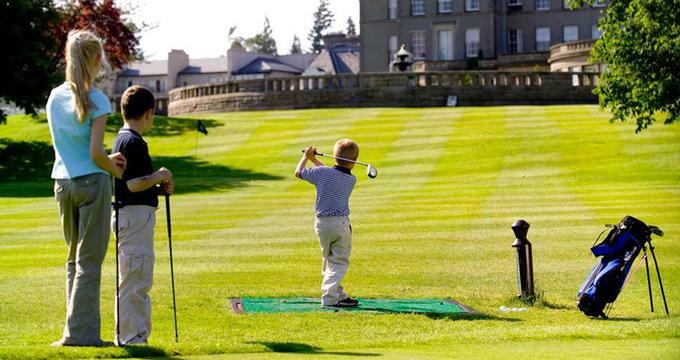 Visit Gleneagles to enjoy beautiful Scottish countryside, relax at the European spa, play golf at one of the resort's three championship golf courses, and take classes at the Equestrian Centre or at the Gleneagles Shooting School. One of the unique activities offered at this resort is falconry. At the British School of Falconry, guests are introduced to the art of handling and flying hawks, beautiful and intelligent birds. If you are up to the challenge, take part in off road driving in a four wheel drive vehicle over two of Britain's most challenging off road courses. The hotel can also arrange Salmon and Trout fishing with an experienced guide. The hotel provides many activities for children, including falconry, junior off road driving, horseback riding lessons, junior golf lessons, mountain biking, archery and air rifle shooting for kids over 10, and a playroom for kids 10 or under. VacationIdea.com Tip: Check for family packages before booking your trip.For golfers, the resort offers three championship courses with spectacular views of the Scottish countryside. There is also a nine hole course and practice facilities where guests can take golf lessons, a great vacation idea if you are trying to improve your game. The Spa by ESPA offers a holistic approach to wellness, letting you rejuvenate and recharge on your Scotland spa vacation. The Spa has beautiful relaxation rooms and a relaxing courtyard. Guests are encouraged to arrive early and unwind in the steam room and saunas. 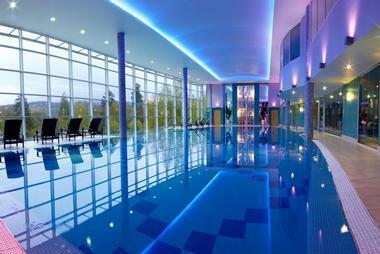 If you are not staying at The Gleneagles, you can book a day spa package instead. The hotel offers 216 luxury bedrooms, including 13 suites, designed in classic contemporary style. Enjoy fine cuisine and a selection of wines at one of the resort's four restaurants. Casual dining is offered at the resort bar. Set in the beautiful Scottish countryside, the resort is a perfect luxury vacation getaway. The 850-acre estate provides a great setting for all of the activities offered by the resort. Summer (June through August) is a great time to visit because of warm weather. If you are flying, Edinburgh and Glasgow airports are about one hour by car from the hotel. Train service is provided by the Great North Eastern Railway which stops at Gleneagles Station. The hotel provides transportation from the train station (be sure to give them advance notice). Doubles from £260 (about US $380) November through April, and from £305 (about US $450) May through October. Golf rates range from £70 (US $100) to £110 (US $160), depending on the season (+44-1764-662231). If you are looking for a golf vacation that the whole family will enjoy, the Turnberry Resort, known for its championship golf courses, health spa, and outdoor activities, is located on the Atlantic coastline in Scotland. Available activities for non-golfers include mountain biking, off-road driving, horseback riding, falconry, target shooting and fishing in a two-and-a-half acre spring-fed loch. The resort completed a full renovation, upgrading all of the rooms, spa and hotel facilities. 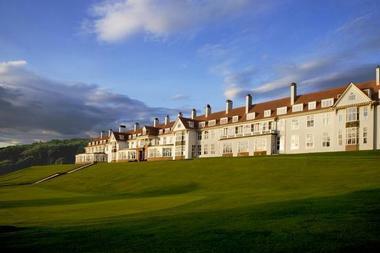 Turnberry is home to three championship golf courses - the Ailsa Course, the Kintyre and the Arran. If you want to polish up your game, the Colin Montgomerie Links Golf Academy at Turnberry offers golf programs for all ability levels. The school has an open air driving range, a short game pitching area, putting course, a 12-hole pitch-and-putt course, 2 indoor/outdoor teaching areas and an audio-visual theatre. The hotel spa employs a holistic philosophy to harmonize mind and body. The spa has a swimming pool with beautiful views of the sea, Jacuzzi, saunas, steam rooms, hydrotherapy suites as well as The Toni and Guy Hair Salon. Spa services include hot stone therapy, reflexology, oriental head massage, aromatherapy, facials and treatments designed especially for men. The resort's eight luxury two bedroom apartments all have a full kitchen, a living room, one bedroom with a king bed and one with two double beds. These apartments are the perfect option for a family that wants the freedom of a private living space and kitchen. The hotel often runs special packages that make the luxury apartments a great deal. Guest rooms and suites are individually decorated with rich fabrics and elegant furnishings. Many rooms offer spectacular views of the ocean. The Outdoor Activity Center is the starting point for most outdoor activities at the resort. Enjoy Trout Angling or Salmon Fishing and have the hotel's chefs prepare your catch for dinner. The falconry center, which houses a range of birds including Eagles, Owls, Hawks, Buzzards and Falcons, offers introductory lessons for £ 55 per person for one hour. The resort offers several gourmet restaurants which prepare dishes using locally grown produce, seafood and game. The hotel restaurant, featuring spectacular ocean views, serves traditional French cuisine and classic Scottish dishes. The Terrace Brasserie, located above the spa, serves light Mediterranean-style dishes. The Tappie Toorie Grill at the Clubhouse offers casual fare. The hotel offers excellent specials so be sure to check their website before you book. Doubles start from £ 375 per night in the summer and from £ 220 in the winter. The rate includes a full Scottish breakfast, use of the swimming pool, tennis courts, mountain bikes, putting greens and the 12 hole pitch n' putt course. Green fees start from £ 90 for hotel guests at the Kintyre Course and from £ 105 at the Ailsa Course. Golf is available from April 1 through October 31, depending on the weather. Major carriers fly to Glasgow International Airport from New York City and many European cities. The resort is 55 miles from the airport (+44(0)1655-333-991). Carnoustie Resort in Scotland is a destination with a championship golf course, luxury spa, excellent food, and more than 200 golf courses within a two hours drive. The hotel is located next to the first tee of the famous Carnoustie Championship golf course, one of the oldest courses in the world. In addition to guaranteed tee times on the Championship Course, and the adjacent 18 hole Burnside and Buddon Links courses, guests have full use of spa facilities, including the pool, sauna, steam room, jacuzzi, gymnasium. The property offers 75 guest bedrooms with views of the course, the ocean or the town. The ten Luxury Suites are named after past Open winners. The hotel has one of the largest bedroom suites in Britain. Calder's Bar and The Dalhousie Restaurant both offer cuisine that fuses fresh produce from Scotland's larder with a Mediterranean flair. Carnoustie can accommodate weddings of up to 250 guests. You can reach the property by car, by train or by air. The hotel is one hour drive from Aberdeen, 1 hour 30 minutes from Edinburgh, 1 hour 45 minutes from Glasgow, and just 20 minutes from Dundee City Airport in Scotland. Nightly rates start at about 40 GBP per person per night. Summer rates range from £250 for a golf course view Double Executive room to £975 for the luxury Hogan Suite (+44 (0) 1241 411999). 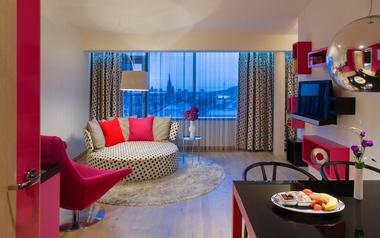 Check into G&V Royal Mile Hotel, Edinburgh to experience five star service and central location on the Royal Mile. Guest rooms and suites feature bright decor and first class amenities, including plush robes, an iPod and free high speed Internet. For some of the best views of the city, ask for one of the Superior Rooms. Families who want more space on their trip can choose from four types of suites: Royal, Lawnmarket, Victoria and George, each with a separate lounge area and sleek decor. Cucina is an award-winning restaurant serving classic Italian dishes with a modern twist. Bar G&V is a local hotspot where mixologists prepare delicious cocktails. Rooms start at 125 GBP per night (+44 (0)131 2206666). The Scotsman Hotel is a full-service luxury hotel in Edinburgh, Scotland. 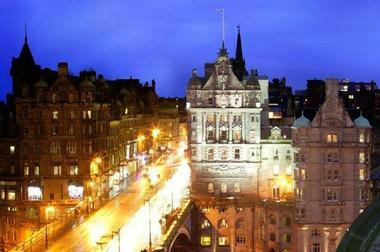 Situated on the city's historical North Bridge, the hotel is near the Royal Mile and the Princes Street. Guest who like to work out on vacation can do so in the hotel's health club which offers a 16 meter stainless steel pool and massage services. The hotel has 56 bedrooms and 13 Suites, each with its own unique interior design. Guest rooms have a DVD player, CD player, wide screen television, a computer with internet access and printer, trouser press, wine bar, coffee machine, and the Scotsman's unique privacy hatches. Room categories include: 12 Study Rooms, 32 Deluxe Rooms, 12 Editors Rooms, 11 Publishers Suites, 1 Baron Suite, and 1 Penthouse Suite. Dine at the North Bridge Brasserie which serves Modern Scottish dishes. Seating options include romantic booths, perfect for an anniversary celebration or a proposal. Waverley Railway Station is a few minutes away on foot, and Edinburgh Airport is six miles from the hotel. Doubles start from £200 per night (+44(0)131 556 5565). St Andrews Bay Resort is a luxury golf and spa getaway featuring two scenic golf courses and a relaxing spa. Set on 520 acres, the resort has 209 guestrooms with luxurious bathtubs, separate showers, high speed internet connection and US/UK compatible outlets. The Manor Homes, situated next to the 4th fairway of the Torrance Course, feature four suites, five bathrooms, a kitchen, living room, dining room and a fully equipped business office. The resort restaurants serve Scottish dishes prepared using local produce and seafood. There is also an extensive vintage wine selection, including wines from the Chateau Elan winery in Atlanta. On weekends, the resort offers 1.5-hour Kidz Club Sessions, including Arts & Crafts, Face Painting and Pajama Party. Cost is £15 per session. Call for current schedule. VacationIdea.com Vacation Tip: Book your spa treatments and tee times before you go. Note the cancellation policy and remember to cancel if your plans change. Edinburgh is 50 minutes south of St Andrews Bay, while Glasgow is 90 minutes south-east of St Andrews Bay. The resort often offers packages which let you save on your room rate, greakfast and activities (+44 (0) 1334 837000). 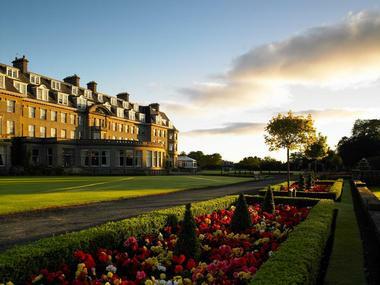 Old Course Hotel in Scotland houses the first Kohler Spa outside of the United States and it overlookes the 17th hole of the famous Duke's golf course. You will be close to the West Sands beach and many other great golf courses in the area. This is a perfect hotel for anybody who loves the game of golf. It is a good choice for vacationers who prefer traditional, smart, and luxurious decor. There are 35 suites and 109 rooms at the hotel, designed by French designer Jacques Garcia. Book one of the suites which offer Kohler bathroom fixtures, Jacuzzi baths and walk-in showers. Kohler chromatherapy baths are offered in some of the suites. 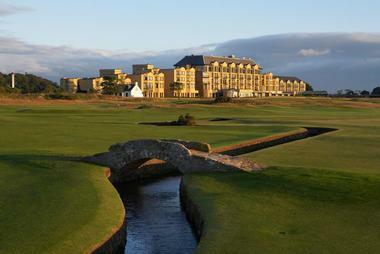 Golfers should request a room with a private balcony which overlooks the Old Course. Rooms and suite choices include the Old Course Rooms, Eden Rooms, Fairway Suites, Old Course Suites, Deluxe Suites, and the Royal & Ancient Suite. The hotel has two main restaurants: Road Hole Restaurant is located on the top floor and Sands Grill on the ground floor. Road Hole Restaurant is the formal of the two and serves formal meals, from starters to desserts. Sands Grill is more informal and offers pasta dishes, steaks and burgers. 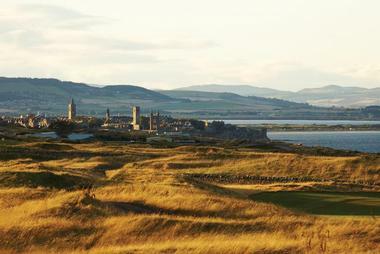 Duke's Clubhouse offers great views of the Scottish coastline and the golf course. Road Hole Bar is the place for a drink since it stocks more than 300 of the finest whiskies. Hams Hame Pub & Grill is the latest addition where you will find 20 types of Scottish single malts, home-grown beers and the best blended whiskies. Hams Hame serves selected beef, lamb, pork and poultry delicacies. Kohler Waters Spa is the place to unwind and relax on vacation. Natural mineral-rich waters offer many healing properties, making this a sanctuary of rejuvenation, balance and relaxation. The hotel is located beside one of the most famous golf courses in the world: Duke's golf course. There are 11 golf courses around the hotel and a golf academy. Room rates start at 315 GBP per night (+44 (0) 1334 474371). If you are looking for a great luxury hotel in Edinburgh, you can't go wrong with the historic Balmoral Hotel. The Scottish hotel has a great spa, historic clock tower, great restaurants and is conveniently located in the city center. The hotel has 188 guest rooms and luxury vacation suites. Ask for a Superior Deluxe King room with a view of the Edinburgh Castle and the Old Town. The Superior Deluxe King guest room measures 388 square feet in size and is decorated in modern style. The spacious bathrooms are finished in marble and ceramic. Guests receive Ren toiletries and plush bathrobes. There are 20 suites which offer a host of luxury amenities, including Complimentary Continental Buffet Breakfast, Complimentary unpacking and packing service, Complimentary pressing of garments for the evening of arrival, Complimentary Internet access, Complimentary in-house movies and In-room check-in. The Deluxe Suite has a lounge with a fireplace, a private dining menu, a well-stocked in-room bar and snack basket, interactive television offering UK and international stations, walk-in dressing rooms, security safe, and a lot of storage space. The spa offers five luxury treatment rooms, a swimming pool, sauna, steam room, gymnasium and exercise studio. After a day of exploring the historic city, head to the spa for a relaxing massage. Number one is a Micehlin-starred restaurant and Hadrian's is a Brasserie-style eatery. The Bollinger Bar at Palm Court serves single malt whiskies, vintage champagne and innovative cocktails. Rates start at 189 GBP per night (+44 131 556 2414). Stobo Castle is a Scottish castle getaway located in the beautiful Peeblesshire countryside, 25 miles from Edinburgh, Scotland. If you are looking for great European spas, head to this unique hotel where relaxation is in the air. The gardens that surround the castle are the perfect place to stroll and relax before and after a spa treatment. Play tennis at the hotel and explore the Scottish rolling hills on a mountain bike. Golf, fishing and horse-riding are available nearby. A 25-meter ozone-treated swimming pool, aerobics studio, spa facility, and gymnasium are all available for guest use. The hotel offers a wide range of guest accommodations including five spacious rooms and the luxurious Cashmere Suite. The Castle Lodge offers vacationers good value for money with rooms starting at around GBP 99 per person per night. At the hotel they say that good food is essential to well being and that self-denial is a matter of choice. Hence, although most people choose to eat a buffet lunch between spa treatments, there are deserts on the menu, and champagne and wine are also available. The hotel is approximately 25 miles from Edinburgh. The hotel staff can arrange for rental cars or a taxi to meet guests at either Edinburgh train station or the airport. Rates are packaged into various categories depending on what type of vacation getaway you are looking for. The hotel offers several package pricing options that include different combinations of accommodations, unlimited use of the Health Suites, and a spa treatment. Prices range from GBP 155 to GBP 410 depending on your package choice. Day visits are also available and range in price from GBP 160 to GBP 220 depending on which package you choose. The Castle Lodge, offers rooms starting at GBP 99 per person per night, sharing, including all meals and use of the castle facilities (01721 725 300).